Now that I have these glasses, I have my life back thanks to Dr Chism. Without the help from Dr Chism, I would not be able to read. Waking up one morning to discover you have no vision would be a nightmare for anyone. 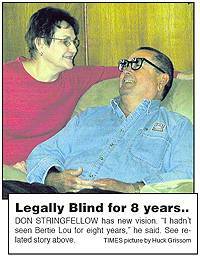 In August of l999, Hughes county native Don Stringfellow, 67, lost his eyesight. He was legally blind. The Popular Wetumka businessman and rancher struggled as a blind person until April. He was a victim of Macular Degeneration, an incurable eye disease. April 5, Stringfellow’s world went from bad to very, very good. With his wife, Bertie Lou, at his side, Stringfellow anxiously put on a new set of unique-looking eyeglasses. “I had not seen Bertie for eight years but immediately after the exam I turned around and there she was,” he said this week. “We called the doctor’s office in Grand Prairie, Texas, immediately. We got an appointment and Don tried on his glasses earlier this month in Grand Praire, she said. Dr. Chism was trained by California optometrist Richard L. Shuldiner. Together they use miniaturized binoculars or telescopes to help people who have lost vision from macular degeneration or other eye conditions. Macular Degeneration is the most common eye disease among the senior population. As many as 25 percent of those over 65 have some degree of degeneration. The macular is one small part of the entire retina, but it is the most sensitive and gives us sharper images, according to medical reports. Unfortunately at this time the treatment is not accepted for payment by most insurance companies or Medicare, the Stringfellows said. The cost, Stringfellow said was $2,500. “I would have paid a lot more if necessary,” he said. “I feel it is a shame that many doctors who know about the treatment fail to tell their patients. Thank goodness, some eye doctors do tell their patients,” Mrs. Stringfellow said. Married since Dec, 14, l962, the Stringfellows have been Wetumka area residents most of their lives, They have four children, six grandchildren and two step grandchildren. She is the daughter of the late Argie and Ugie Taylor of Wetumka. Stringfellow’s parents are the Mr. and Mrs. J. W. Stringfellows, all lived in Wetumka. Don and Bertie Lou opened an “Otasco” store on Wetumka’s main street on Feb. 10, 1976, They later built a new facility at main and Broadway and owned three more “Otasco” stores. Today, Stringfellow can drive and enjoy his family. He spends most of his days at their ranch home south of Wetumka about three miles or attending to the grandkids. Stringfellow served as a Wetumka council member, Chamber of Commerce president and held other community post before retiring due to his failed eyesight.